Image: Ghar Hassan, Anne Oldham in main entrance. © Tony Oldham, 22-FEB-2002, with kind permission. Location: Hal Far, Malta. 2km south-west of Kalafrana, well signposted from the Kalafrana/Zurrieq road. Image: Ghar Hassan, Anne Oldham in main passage with gate. Image: Ghar Hassan, Anne Oldham in main passage. There are many legends about this cave on the southern coast, all featuring the Saracen, Hasan, who took refuge here, and most of them referring to at least one young maiden that he abducted and imprisoned. The cave setting is most spectacular. 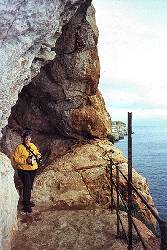 From the car park, a foot path over a "karst garden", leads to a flight of 25 precarious steps, heading down the limestone cliff high over the sea. A walk along a narrow path, carved out of the cliff, protected by a very rusty guard rail leads to the entrance. 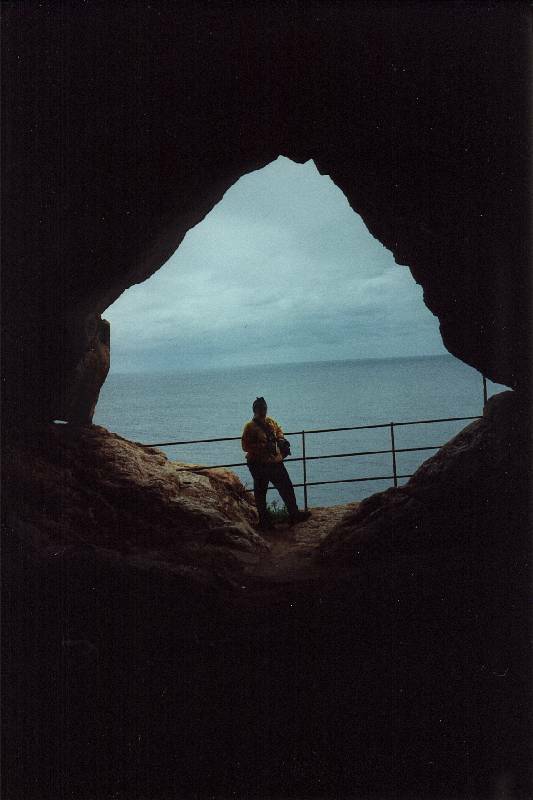 Hasan, apparently, entered the cave from below via a rope tethered at the entrance. The main entrance to the cave is 5m high and 6m wide and the entrance is of similar dimensions for the first 20m. In the top of this passage is a roof tube, sometimes separated from the main passage by a thin layer of rock and sometimes just a half tube in the roof. Partially enlarged master joints can be seen crossing the main passage. Most of them come to a dead end but a large one extends for 48m and 73m respectively to two further entrances along the cliff face. At the eastern entrance there is a man made circular chamber, with obvious pick marks on the walls, and a stone bench around the edge, it has been speculated that this was, in fact, where Hasan lived. 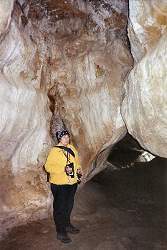 The cave is almost bereft of formations, although there are some small stalactites and some splash deposits. 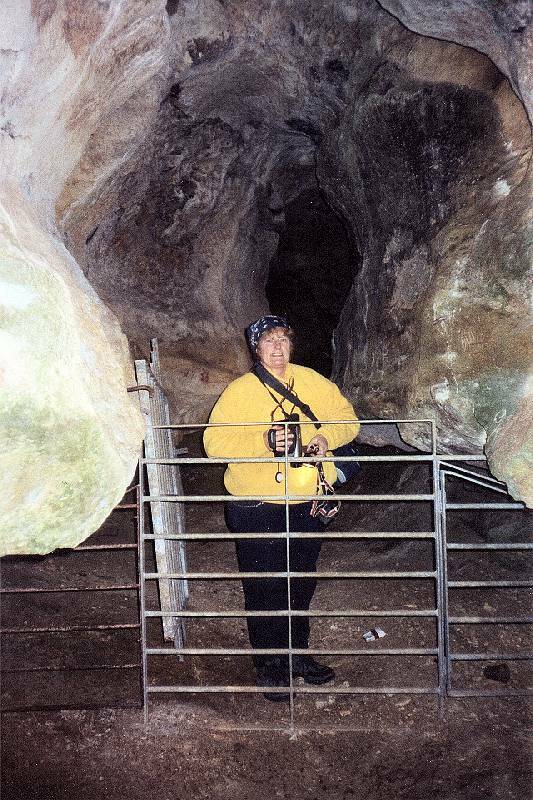 A broken iron gate bars the inner recess to the cave. Here, according to Savona-Ventura are some cave paintings, but, as they were only discovered in the last 10 years, their antiquary is in some dispute. The cave is heavily trashed and there are syringes and guano in evidence. Watch where you walk and wear gloves. The lady who sits in a hut in the car park will lend you a torch if you give her a tip. 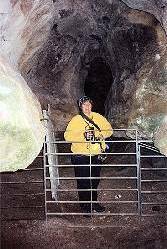 Otherwise take your own as little of the cave can be seen from the daylight which filters in from the entrances. Search Google for "Hasan's Cave"